Nowadays, it is assumed that the major storage of soil moisture is contained in the upper two-metre layer, the moisture content of which amounts to 0.2 m. If one excludes a part of the land occupied by glaciers and permanent snow cover (~10%), permanent frost (~ 14%), and by arid and semiarid regions (~21%), where soil moisture is present during relatively short periods, then the area of the moisture-containing soil cover will be about 55% of the land area or 82 x 1012 m2. The total storage of soil moisture is thus 16.4 x 1012 m3. Soil moisture exists in two forms: liquid (water) and gaseous (water vapour). Water transport is determined by the motion of water in capillaries and non-capillary pores, and water vapour transport is due to molecular diffusion. Because of this, maximum soil moisture content (moisture capacity) depends, generally speaking, on the distribution of capillary and non-capillary porosity (fraction of capillaries and pores in a unit volume of soil), the level of underground water, the value of underground run-off, water surface tension in capillaries, and on the coefficient of molecular diffusion. In the presence of vegetation it will also be determined by the depth of penetration of the plant root system, its vertical distribution, and by the capacity to absorb moisture from soil. Information about these parameters is extremely fragmentary, which fact would not have given cause for concern were the soil moisture content not to affect the state of the climatic system. But actually the case is somewhat different and the results of numerical experiments for excessively moist and dry soil are the most convincing evidence of the impact of soil moisture content on the climatic system state. Note that under conditions of excessive moistening, the soil water content is equal to its critical value for which evaporation is equal to evaporability; in dry soil it is equal to zero. In this discussion of the results of numerical experiments we begin with those carried out by Kagan et al. (1990) on the basis of the 0.5-dimensional seasonal model of the ocean-atmosphere system. Comparison of results of the first and control (complying with the present-day climate) experiments shows that excessive soil moistening results in an increase in evaporation and precipitation, and in a decrease in run-off. An increase in latent heat flux at the land surface leads to a rise in temperature and moisture content in the atmosphere, and to an increase in absorption of short-wave solar radiation in the atmosphere and its decrease at the underlying surface. The net radiative flux at the land and ocean surface increases at temperate and low latitudes, and decreases in the area of cold deep water formation. At the same time, heat transfer from the ocean into the atmosphere in this area increases. Nevertheless, the sea water temperature in the area of cold deep water formation increases as a result of a diminution of this area because of a displacement toward the north of the boundary between the northern and southern boxes. A rise in temperature in the area of cold deep water formation promotes warming of the deep ocean and a reduction of the sea ice area and snow mass at the sea ice surface. The temperature of the snow-ice cover surface, as well as that of the sea surface, increases, while the surface air temperature remains constant, which is explained by the compensating effect of a fall in the land surface temperature. A decrease in soil water content down to zero causes opposite (as compared to the first experiment) changes of climatic characteristics in the southern box, as could be expected. But in the northern box the following events occur. Here, because of the abrupt rise in the land surface temperature, the surface air temperature also increases. This results in a decrease in the meridional temperature contrast, in a displacement of the boundary between boxes toward the north, and in a decrease in land fraction in the northern box and, hence, in a water-air temperature difference in the area of cold deep water formation in autumn and winter. As a result, the heat transfer into the atmosphere decreases in this area, its temperature rises, the heat transport into the polar ocean increases, and sea ice disappears. An increase in temperature in the area of cold deep water formation is accompanied by warming of the deep layer at temperate and low latitudes, by a decrease in the temperature difference between these areas, and by a weakening of upwelling. The latter causes an increase in thickness of the UML and, hence, a decrease in the sea surface temperature at temperate and low latitudes. Finally, we note a strong (of almost two orders of magnitude) decrease in the meridional latent heat transport in the atmosphere determined by an appropriate decrease in contrast of air humidity between the northern and southern boxes. Similar limiting situations were also reproduced within the framework of three-dimensional general circulation models. As this takes place, the sea surface temperature and sea ice area were assumed to be fixed and to comply with the present-day climate. The last suggestion, in the light of the data presented above, looks somewhat artificial. Nevertheless to estimate tendencies to climate changes appearing, say, when operating large irrigation or drainage systems the simulation of such a situation makes sense even in such a formulation. From this viewpoint, for the case of dry soil the most significant consequences are, on the one hand, a rise in the land surface temperature that is connected with the exclusion of the cooling effect of evaporation, a decrease in the surface atmospheric pressure, amplification of upward vertical motions, and, despite all of this, a decrease in cloudiness and precipitation (due to a reduction in air humidity) over continents, and, on the other hand, attenuation of downward vertical motions and, hence, a decrease in cloudiness and precipitation over the ocean. In the case of moist soil the changes in climatic characteristics over continents and the ocean are opposite to those given above. It is interesting to note that maximum changes in precipitation-evaporation difference occur in the tropics in this case, too, due to the displacement of the northern and southern Hadley cells with a consequent change in the vertical and horizontal transport of water vapour in the atmosphere. The strong dependence of the climatic system state on changes in soil moisture content produces rather stringent requirements as to the accuracy of the chosen parametrization of the moisture transport in soil. At present, three methods, proposed by Budyko (1956), Hansen et al. (1984), and Deardorff (1977), have gained widest acceptance. The first of these is based on the presentation of the active soil layer in the form of a single layer with finite thickness and on fixing a critical value of moisture content and moisture capacity (a modified version of this method, called the 'bucket' method, is presented in Section 5.5); the second is based on singling out two layers of finite thickness which interact by means of diffusive moisture transfer; and the third is based on the separation of two weakly interacting layers - the upper 0.5-cm layer which responds to precipitation and evaporation, and the lower 50-cm layer which serves as a source of moisture for the upper layer. In the latter case it is assumed that diffusive transfer is always directed from the low layer to the upper one, and moisture influx into the low layer occurs due to instantaneous infiltration of water from the land surface. The test of these three parametrizations carried out within the framework of a one-dimensional radiative-convective model showed (see Hunt, 1985) that the first two methods entail undesirably long periods to establish maximum values of temperature, and a short period to establish minimum values of soil moisture content. In this sense the third method (the so-called force-restore method) is preferable, in any event, in the absence of vegetation. 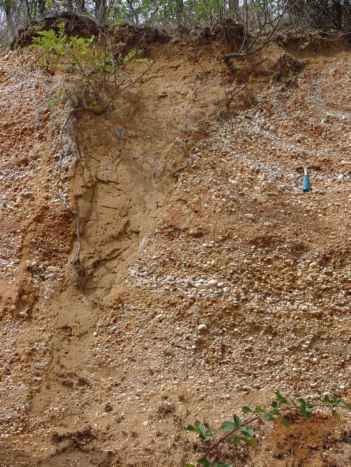 In the presence of vegetation the deep soil layer provides moisture for évapotranspiration. But this method also has its own disadvantages, the main one of which is an excessive sensitivity to the choice of characteristic time of diffusive moisture transfer in soil and the thickness of layers.